Kelly and Jeff hurried into the entrance of the fair. They had promised to meet Hans in front of the Fun House at one o'clock. "It's almost one o'clock now," Jeff said. "We need to find the Fun House fast. Where is it?" Kelly pointed to something near the entrance. "This will tell us!" she said. us where things are. They can help us get where we want to go. A map is a drawing of an area of the earth as seen from above. The title of a map tells you the area or subject of the map. The area shown on a map can be large, such as a continent. Maps also can show small areas, such as parts of your community. A map has symbols that stand for real things. For example, on many maps a small circle or dot is the symbol for a town or city .Symbols are explained in a box called the map key. Find the key on the Fun Fair map this map. Next find the direction symbol on the map. The direction symbol looks like a large plus sign, and it shows which way directions are on the map. The letter N on the direction symbol means north, or toward the North Pole. On this map, north is toward the top. North, south (8), east (E), and west (W) are called cardinal directions, meaning main directions. The direction symbol also can be used to find intermediate directions. Intermediate means "in between." For example, northeast (NE) is between N and E. Northwest (NW) is between N and W. Where are SE and SW? between these lines are labeled from top to bottom with letters. The two sets of lines make squares that can be referred to as A-1, A-2, and so on. The grid squares are useful for describing where something is located on the map. 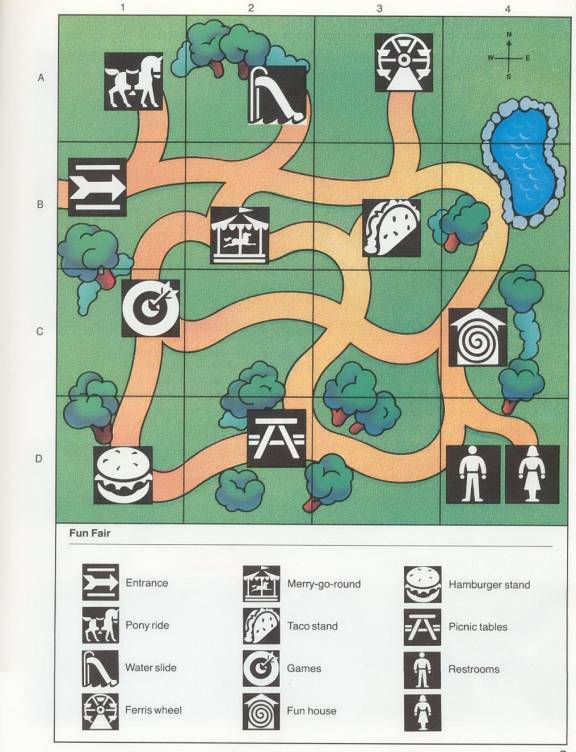 For example, the hamburger stand on the Fun Fair map is located in square 0-1. Answer these questions and put your answers in your Social Studies notebook. 1. Where do you look to find what the symbols on the Fun Fair map mean? 2. Where do you look to find which way is north at the Fun Fair? 3. Why do\you use a grid square? 6. In what grid square is the Fun House located? 7. In which direction would you walk to go from the pony rides to the Fun House? a. What does your friend want to eat? b. What do you want to eat? 9. You decide to buy the different foods you want and meet to eat in D-2. What is there?